Crockett Law Corporation is a law firm that provides effective and practical legal advice and solutions for clients throughout the Orange County area and Southern California. 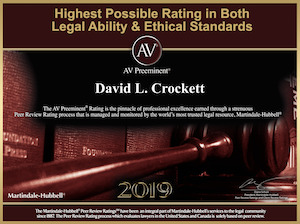 For more than 30 years, lawyer David Crockett has represented the complex and sophisticated needs of individuals, trusts, estates, probates, executors, conservators, beneficiaries, trustees, heirs and business proprietors and property owners. Trusts: Formation of trusts and counseling about what kind of trust works for the situation; explanation of the roles of the trust creators, trustees and beneficiaries; preparation of all trust documents including related deeds, powers of attorney, and pourover wills; advise re the estate, property and income tax effects of the trust involved; amendment of trusts; interpretation of trusts formed by other attorneys in the past; advising trustees and beneficiaries when there are disputes; filing and defending trust litigation when needed; administration and accounting for trusts; and trust termination advice and legal documentation. [For more information on Trusts click here]. Trust and probate administration: Administration is the many-step process of dividing up an estate and paying the assets to the people who are entitled. The concept is simple but the actual job involves a lot of detail and decisions. As an Orange County Trust and Probate lawyer and Certified Public Accountant, Mr. Crockett guides clients through the complex maze of Probate and Trust administration laws. These laws are found in the CA Probate Code, Internal Revenue Code and the CA Revenue and Taxation Code. Administration for Trusts and for Probate estates is similar but there are differences. The firm advises trustees and Probate executors on when administration is needed; what legal notifications need to be sent and when and to whom; what are the legal accounting requirements; what government agencies need to be notified; what tax forms need to be filed; when and what records need to be kept and when the trust or probate estate assets and money can legally be paid out to the beneficiaries. If there needs to be a Probate then in addition the firm prepares and advises on all Probate court forms and notifications and provides courtroom representation. Experienced advice is also provided to try to resolve disputes and avoid expensive litigation. Since Mr. Crockett is also a licensed real estate broker and Orange County Real Estate Attorney, he can provide practical advice about the selling of trust or estate real estate. [For more information on Trust and Probate Administration click here]. Probate: Probate Court may be needed to transfer ownership of deceased persons’ money and property. Probate can sometimes be avoided or shortened as well, even after a person has died. The firm prepares all necessary Probate Court forms and advises on all aspects of Probate. Once Probate is commenced, there are many legal, accounting and tax steps to be taken before the Probate estate can be closed and the assets distributed. See the section above on Trust and Probate Administration for more details. We provide advice and representation to executors who are charged with administering the estate and also to heirs who are wanting to make sure they get their share of the estate on a timely basis. Probate litigation services including competency challenges and will contests are also provided. [For more information on Probate click here]. Trust and Probate Litigation: Legal representation in court is provided for all types of Probate and Trust Litigation. As an Orange County Trust lawyer, Probate lawyer, and Certified Public Account, Mr. Crockett is well positioned to advise in these types of cases. This type of litigation is almost always about money and where it went and who is entitled to it. There are specific laws in the Probate Code about accounting for money which are often neglected which leads to beneficiaries needing to file probate court petitions (lawsuits) for accounting, trustee removal and surcharge. The firm represents beneficiaries and also represents/defends trustees and executors. Litigation can also arise in the interpretation of wills and trusts, the enforcement of no-contest clauses, and the administration of trust assets where the trustee doesn’t do what the trust requires. In addition, heirs and trust beneficiaries sometimes sue because of trusts and wills being created under suspicious circumstances such as: fraud, undue influence or lack of legal capacity, elder abuse. The firm also represents parties in Conservatorship litigation where someone is trying to get someone else declared legally incompetent so that they can control assets and living circumstances of the proposed Conservatee. [For more information on Trust and Probate Litigation click here]. Wills: As an Orange County Trust and Estate Lawyer, Mr. Crockett advises on wills and prepares all types of wills. Amendment of wills is done and interpretation of wills prepared previously is done. The pros and cons of wills versus trusts can be discussed as most people decide to have a living trust done to avoid probate. Questions of will validity and competency to make a will are sometimes a concern and also how to protect a will from legal attack for lack of competency or fraud. Advice is also provided on who will receive a person’s estate according to the wording in the will or who will receive the estate if there is no will. Legal representation in probate court proceedings and litigation over wills including Will Contests is provided. [For more information on Wills click here]. Estate Planning: As a Newport Beach and Orange County Trust and Estate Lawyer and Certified Public Accountant, Mr. Crockett advises on and prepares all types of estate plans. There are many variations to an estate plan and each one is custom tailored to your personal situation. A typical estate plan will create a custom prepared trust which will (i) be changeable (revocable); (ii) will keep your estate out of the probate court system; (iii) will keep your affairs private; (iv) will have a definite plan as to who receives your money and property on your passing; (v) will provide for your surviving spouse; (vi) will be set up to save estate and gift taxes; (vi) will minimize property tax increases on your passing: (vii) will state exactly who will be the successor trustee to control the trust and for how long and (viii) consider income tax implications of transfers of money and property. Different types of property and assets have different requirements as to how to incorporate them into the estate plan and Mr. Crockett is experienced at advising in this area. Not all assets or property should go into a trust as there may be other alternatives which should be considered. Advice is provided about tax implications of estate planning and transfers into and out of trusts. The taxes which are always considered are estate taxes, income taxes and property taxes. The role of life insurance in estate plans is also considered. [For more information on Estate Planning click here]. Taxes and Planning: As a Newport Beach and Orange County Trust and Estate Lawyer and Certified Public accountant, Mr. Crockett provides an insightful view of clients’ tax situations. All tax returns and forms can be analyzed and understood since Mr. Crockett as a CPA prepares tax returns. Advice is provided in any estate or trust or real estate situation about (i) property taxes; (ii) income taxes and (iii) estate taxes. Proper planning often can minimize taxes or at least avoid unwanted tax surprises. Nearly all legal documents (wills, trusts, estate plans, real estate deals, etc.) have tax implications. There is a vast array of tax planning measures and techniques which can be created including irrevocable life insurance trusts, intentionally defective grantor trusts; family limited partnerships, S-corporations, limited liability companies, out of state and out of country trusts and companies, buy-sell agreements, domestic and foreign asset protection trusts, charitable remainder trusts, qualified domestic trusts, qualified personal residence trusts, Crummy trusts, education trusts under IR §530, generation skipping trusts, and special needs trusts. [For more information on Taxes and Planning click here]. Asset Protection: Asset protection services include formation of classic asset protection entities such as corporations, family limited partnerships, irrevocable life insurance trusts, limited liability companies and specialized types of trusts including out of state and out of country entities. Additional techniques we can assist with are equity stripping, insurance strategies, gifting, formation of multiple entities, spendthrift trusts, intentionally defective grantor trusts, and domestic asset protection trusts. Asset protection planning is best done and most effective when a person is not faced with unsurmountable and serious liabilities. The laws against fraudulent conveyances must always be considered when doing any asset protection planning. [For more information on Asset Protection click here]. Real Estate Law. With over 30 years of experience, Mr. Crockett is able to discuss and visualize all types of real estate transactions and negotiations from three points of view: Lawyer, Real Estate Broker, and Certified Public Accountant. Virtually all trusts, probates and estate planning handled by the firm involve real estate. Nearly all real estate documents can be prepared in house relatively quickly. We prepare all deeds, trust deeds, purchase and sale agreements, limited liability companies, limited partnerships, leases and rental agreements, options, and tenancy in common agreements. Areas of real estate law covered are legal title and deeds; ownership succession, community property vs separate property, escrows, closing and settlement statements, specific performance, lis pendens, title disputes, title insurance, landlord-tenant law, premarital and post marital agreements, mechanics liens, tax-deferred exchanges, installment sales and capital gains. Given the ability to review and understand how real estate is reported on all tax returns, tax consequences of real estate deals can be determined in advance. Once the tax consequences are known, available alternatives can be considered. Litigation services on real estate matters are also available. [For more information on Real Estate law click here].